The Global Volcanism Program has no activity reports for Voyampolsky. The Global Volcanism Program has no Weekly Reports available for Voyampolsky. The Global Volcanism Program has no Bulletin Reports available for Voyampolsky. Voyampolsky and Kakhtana are two Icelandic-type basaltic to basaltic-andesite shield volcanoes that form the NW-most volcanoes of the N-S-trending Sredinny Range, which stretches across the western side of Kamchatka. They are located near the headwaters of the Kakhtana River and were constructed along an E-W line west of the crest of the Sredinny Range. Icelandic-type basaltic to basaltic-andesite shield volcanoes extend the length of the Sredinny Range, which has a large basaltic component (Erlich and Gorshkov, 1979). Early geologic studies in the Sredinny Range (Ogorodov et al., 1972) identified numerous Holocene eruptive centers based primarily on morphological criteria. However, later work has suggested that Sredinny Range volcanoes are less mantled by Holocene tephras than eastern Kamchatka volcanoes and therefore appear more youthful, so that Holocene eruptions are uncertain for many of these Sredinny Range eruptive vents. The Global Volcanism Program is not aware of any Holocene eruptions from Voyampolsky. If this volcano has had large eruptions (VEI >= 4) prior to 10,000 years ago, information might be found on the Voyampolsky page in the LaMEVE (Large Magnitude Explosive Volcanic Eruptions) database, a part of the Volcano Global Risk Identification and Analysis Project (VOGRIPA). There is no Deformation History data available for Voyampolsky. There is no Emissions History data available for Voyampolsky. Voyampolsky (center) and Kakhtana (right-center) are two Icelandic-type shield volcanoes that form the NW-most volcanoes of the Sredinny Range, which stretches across the western side of Kamchatka. 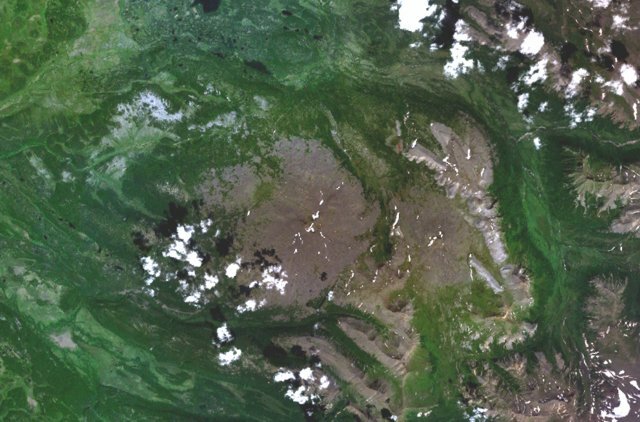 The two shield volcanoes, 1225 and 1217 m high, respectively, are located near the headwaters of the Kakhtana River, which extends from the lower right to the upper left of this NASA Landsat image (with north to the top). The two volcanoes were constructed along an E-W line west of the crest of the Sredinny Range. There are no samples for Voyampolsky in the Smithsonian's NMNH Department of Mineral Sciences Rock and Ore collection. Large Eruptions of Voyampolsky Information about large Quaternary eruptions (VEI >= 4) is cataloged in the Large Magnitude Explosive Volcanic Eruptions (LaMEVE) database of the Volcano Global Risk Identification and Analysis Project (VOGRIPA).